GEOLOGY OF THE KNOBSTONE HIKING TRAIL: WHAT’S AN ESCARPMENT? 400-200 millions of years ago. Today’s scenic vistas were created when a ridge of rock strata, now known as the Martinsville Hills—Knobstone Escarpment emerged. An escarpment is a big ridge of hills rising abruptly from a plain. The Martinsville Hills-Knobstone Escarpment is “associated with” the Cincinnati Arch formation to the west, and erosion of the surface limestone to the east. This left the ancient sea bed below, now named the Scottsburg Lowlands in the eastern section of Southern Indiana (photo left). The KHT ridge’s underlying Borden sandstone bedrock extends from Louisville north to within 30 miles of Indianapolis, ending at Martinsville. The east face of the ridge is characterized by high knobs and bluffs on the Norman Uplands, with a gentle slope westward towards Illinois (photo right). What’s an escarpment? What is remarkable about the photos at left and right is that they were taken on the same date, October 21, 1995, from the exact same place. The place was Round Knob, Mile 6 on the KHT, and they capture the views to the east and west from the knobstone escarpment. Factors that go into creating the striking difference between the two include, but do not entirely explain, differences in elevation, soil, rainfall/water availability, and aspect (orientation to the sun). 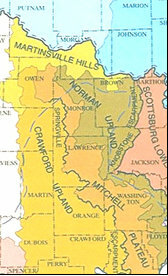 The Indiana state physiographic map (left) shows the extent of the Scottsburg Lowland and Norman Upland features and the counties the escarpment passes through, from Morgan to Floyd. FYI: the blue was once the Silurian Sea but is now just flat corn country. 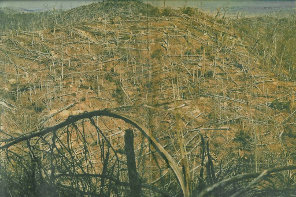 1930s – State and federal agencies buy many escarpment and hill acres (much of it abandoned marginal farmland) for public forests. In a program that combined both Depression-era employment and improvement of eroded forest slopes for conservation purposes, the Civilian Conservation Corps was formed and provided the major labor for reforesting the worst sections. Thousands of acres of fast-growing, mostly non-native pines were planted to forestall further soil erosion. A TRAIL IS BORN 1973 – In the environmental 70s, the Indiana Department of Natural Resources assigns Gerald Pagac, fresh out of college, the task to research DNR acres for enough land to allow the building of a significant long-distance hiking trail. Gerry, one day to be the director of the DNR Division of Parks, conceives the vision of the Knobstone Trail, a hiking trail spanning the many acres of state forest lands in South Central Indiana. 1975 – A new DNR Division of Outdoor Recreation employee, Joe Payne, was hired to build the new trail. 1981 – The DNR completes the first major portion of the trail, following the forested high bluffs of the Knobstone Escarpment. This section, long known as the “KT,” begins 10 miles north of Louisville, at Deam Lake (photo). It passes through Clark, Scott, Jackson, & Washington Counties, to a point midway between Salem and Brownstown. The 45 miles of trail were built with the aid of Scout troops and groups, such as the Indianapolis Hiking Club. 1981 – The Knobstone Hiking Trail was featured in the Outdoor Indiana Publication. Written by Joe Payne. 1992-6 – DNR-DOR drafts Knobstone Trail Expansion Plan to complete the original vision of the KHT. This planning process was overseen by Mike Martin, working with representatives of all the relevant public and private stakeholders in the project. 1994 – Hoosier Backpackers are gathered together by Suzanne Mittenthal at trail mentor Stan Newhall’s home to build an organization to improve Hoosier hiking trails. 1995 – The Hoosier Hikers Council incorporates, to rehabilitate, build and maintain hiking trails in Indiana. One of the HHC’s basic objectives is to complete the Knobstone Hiking Trail (KHT). 1997 – Morgan-Monroe/Yellowwood State Forest’s property manager Jim Allen decides to begin construction of a long-distance trail on his forest property, in response to the DNR’s Knobstone Trail Expansion report. As a forest employee, Suzanne Mittenthal names and directs the building of the trail, working with volunteers. It was named the Tecumseh to commemorate the Indian leader who once roamed the lands that became the state of Indiana. The initial miles incorporate the Low Gap Trail Backcountry Area, designated in the 1970s by the DNR as the Hoosier equivalent of a federal Wilderness area. 2001 – HHC volunteers complete the 42-mile Tecumseh Trail, the north section of the Knobstone Hiking Trail. It is built primarily on public lands starting south from Martinsville, in Morgan-Monroe/Yellowwood State Forest, extending down to Monroe Reservoir. 2003 – Work begins to assemble easements to cross the mainly private acres of the central section of the KHT, dubbed the Pioneer Trail. Farmer Greg McPike donates land for a KHT trail-side park in Sparksville, for camping in the middle of the easement section. 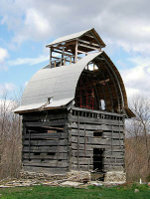 Pioneer barn is restored along the PT by Frank Fisher (photo). 2004 – Jackson County officially adopts the Sparksville Park as its second county park. As well as thru-hikers on the KHT, the park will serve local residents, with its picnic pavilions, camping area, trails, privy, volleyball, basketball and playground equipment,. 2005 – Endorsements of the project to complete the 150-mile KHT are approved by all the five Boards of County Commissioners along the PT route: Monroe, Morgan, Brown, Jackson, & Washington. 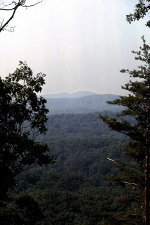 2010 – HHC purchase of land for the KHT in Washington County is conveyed to Oak Heritage Conservancy for permanent protection (view from Hikers Knob, photo right). 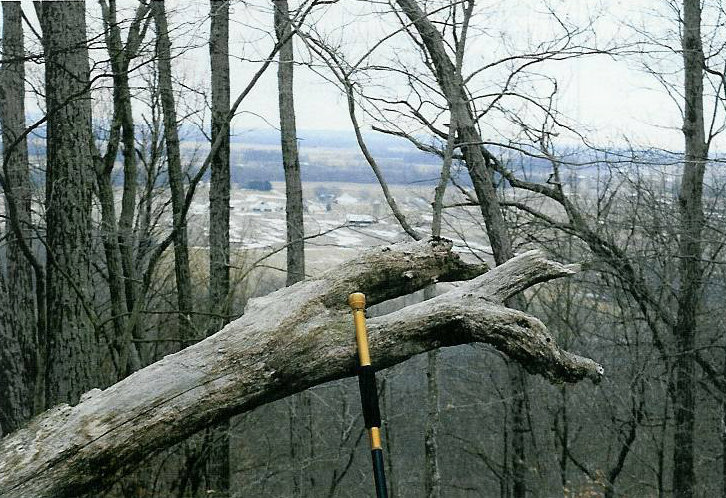 2011 – In March, a tornado obliterated all standing timber on top of Round Knob–Mile 6 on the KHT where the two escarpment photos were taken in 1995. A mile wide path of greenery was devastated. Hikers now have the fascinating opportunity to observe the forest recover. Photos will be posted chronicling the regrowth. A great 5-mile RT rugged day hike includes both scenic old and Mile 6 regrowth areas. 2013 – The Knobstone Hiking Trail Association incorporates as a non-profit corporation, a natural outgrowth of the HHC. Its mission and members “are dedicated to the completion, preservation, and promotion of the Knobstone Hiking Trail. This footpath follows the Knobstone Escarpment from 30 miles south of Indianapolis to 10 miles north of Louisville. A long-term management organization for the trail assures continuity of assistance in maintaining the trail to the governmental entities whose jurisdictions the trail passes through.” The KHTA Board is composed of hikers, trail builders, and community leaders. 2014 – Martinsville native John W. Jones donates a 200-space parking lot for a future hoped-for trail head.at the edge of Martinsville in Morgan County. 2015 – The Martinsville Sportsmen and Conservation Club provides a provisional easement to create a new northern KHT trailhead. It’s near the Jones Parking Lot, on Burton Lane, .2 mi. from its intersection with SR 37 at the south end of Martinsville. This easement connects to adjacent Morgan-Monroe State Forest property, allowing a 7-mile extension of the Tecumseh/KHT. Work began instantly on building the trail. Official permission to begin trail work on the state property is pending.